A gem location, near the beach, near to Hilo, gorgeous views, private and quiet. SPECTACULAR VIEWS await you at Kahoa House for your Hawaiian holiday. Early-birds and mainlanders adjusting to the time difference can enjoy a cup of Ka’u coffee in the comfortable living room, and watch the sun rise out of the Pacific through the large east-facing window. Our promontory juts into the ocean near a turn in the coastline. Looking left you see the surfers and paddle boarders ride waves at Honoli'i Cove, and beyond you see several other headlands along the coastline to the north. Looking right you have a view of Hilo Harbor to the south, where cruise ships land for port of call, and Leleiwi Point off to the east. Especially during winter, whale sign dot Hilo Bay before you. KAHOA HOUSE’s 3BR/3BA DESIGN ensures a comfortable and efficient stay for you and your family. Two master suites each feature king-size beds, ocean views, double vanities, and walk-in showers (one with steam!). The third bedroom is also set with a king bed (separated to two twin beds upon request), has a built-in granite desk, and an en suite bathroom with tub/shower. The bathrooms and kitchen are adorned in stone and granite, and wood floors stretch throughout the house. The long axis of the main living area, with its wooden floors & paneling, and panoramic views of the ocean below, give the house a nautical feel. The décor has a SE Asian influence with Buddhist artwork collected from travels in that region. The kitchen is well appointed for cooking family meals, including a nice set of All Clad stainless steel pots and pans, good knives, and a wide assortment of kitchen gadgets. The deep sink with double faucets and dish washer aid with cleanup. While the house is comfortable with ocean views from most rooms, you may still want to spend most of your time outside. Walk barefoot in the spongy green grass and admire the coconut palms swaying overhead. Dine al fresco on the main lanai. As the sun sinks below the ‘Aina behind you, watch the ocean and sky turn colors. Retire to the cozy, cushioned, rattan furniture for more conversation and another glass of wine. Or, move to one of the two decks on the other side of the house. The balmy Trade Winds make the outdoors pleasant well into the evening. Afterward, set the mood as you like indoors with lighting on dimmers. At the end of the day, crawl into a comfortable bed, and listen to the sound of the ocean as it breaks on the shore, lulling you to sleep. A WELL EQUIPPED RENTAL HOME. We have travelled the world and done many trips in VRBOs, so we understand and appreciate the value of a well equipped home. There's nothing worse than bringing in the groceries to find only one scratched-up pan with the Teflon falling off. We've stocked the KITCHEN with All Clad stainless steel pans, a few non-stick pans, Henckel knives, prep bowls, and lots of kitchen gadgets. EXERCISE - do yoga on the lanai as you watch for whales! We have 3 yoga mats, a sit-up pad, and resistance bands for your use. BEACH - 6 beach chairs, two sizes of coolers, and 3 body boards of various sizes. WHALES - 2 pair of binoculars for your use at the house. RAINY DAYS - 3 large golf umbrellas, a selection of classic board games, playing cards, UNO, old maid, and a small assortment of children's story books. INTERNET & TV - We have high speed cable internet and a terrific wifi signal throughout the house and lanai. There is also basic cable television (if you're so inclined). BDVD/CD player also gives access to your NetFlicks, Amazon Prime, and other accounts. Your MUSIC will sound amazing on the Dolby 7.2 home theater, with Bluetooth connectivity via the receiver. Relax on the new (Jan 2017) microfiber SOFA & LOVESEAT. The arrangement of the new furniture enables guests to enjoy watching all the activity at Honolii Cove and Hilo Bay, as the low back of the loveseat does not obstruct the view. LOCATION!!! Welcome to Hilo and the Hamakua Coast. Big Island vacationers in-the-know, choose the windward eastern side of the island for its lush, tropical, natural beauty, and for its less touristy, peaceful, relaxed vibe. Staying at Kahoa House offers the convenience of nearby old-town Hilo for its shops, restaurants, and farmer’s market. HONOLI'I BEACH, is within walking distance. Keep walking along our street under the JUNGLE CANOPY for a few more minutes to discover bridges over streams and several WATERFALLS. Also nearby are pristine Onomea Bay, the trails through its Botanical Gardens, Akaka Falls, and eco-adventure activities. Volcano National Park, the Waipio Valley, and the vista point on snow-capped Mauna Kea are all good daytrips from here. Offshore activities can also be organized out of Hilo. If your flight is via Kona, the drive to Kahoa House is less than 2 hours. If your flight is via Hilo, the airport is less than 15 minutes. *PLEASE NOTE: This lovely property came under new ownership and management as of late May, 2015. Choose Kahoa House for your next Hawaiian holiday! You will not be disappointed. Most guests only regret not booking for a longer stay. Recommended stay is 7 days to balance sight seeing with quality rest & relaxation time at the house, while taking advantage of the weekly rate. (C) Guest vehicles shall be parked in the designated onsite parking area. We have been living and working in Africa and Asia since 2007, and have definitely leveraged our expat residency, traveling to off the beaten path places at most every opportunity. We've explored Mali all the way to Timbuktu, climbed to the peak of Mt. Kilimanjaro and gone on safari in Tanzania, communed with gorillas in the wild in Uganda and Rwanda, rode donkeys to remote high altitude rock-hewn churches in Ethiopia, hiked in the Annapurna portion of the Himalayas in Nepal, mountain biked in Bali, dove with Manta Rays and walked through Komodo Dragon turf in Indonesia, ridden Elephant-back in Thailand, taken a train ride through tea plantations in Sri Lanka, skied at the Matterhorn, kite boarded in Mauritius, and toured some of the most amazing Buddhist temples in Myanmar, Bangkok, and Java. But, all those experiences, all the beauty and culture we've had the opportunity to sample abroad, are best reminisced while enjoying a cup of coffee or glass of wine, walking barefoot through the spongy grass at Kahoa House as the coconut palms sway in the breeze, the surfers carve the waves, and the whales spout, play, and breach right before your eyes in Hilo Bay. For us, there is no better place to return to than the Hamakua coast, which is why we bought this home. We plan to make it our permanent residence someday, but for now it is our favorite vacation destination. We hope you also make beautiful memories while staying here and exploring the Hamakua Coast - one of the most intensely beautiful places in America. Our property manager, Randall, and his wife, Donna, are dear friends that we met by staying at their VRBO listing, also along the Hamakua Coast. Native to Hawaii, it's always been their base. When they decided to move from Kauai they chose the east side of the Big Island. A lovely enclave of Hawaii, far from the high-rise madness of Waikiki and close to the ancient roots and old migration routes to this lovely pacific island. We stayed at the property for a week in January of 2015. We loved the house so much we made an offer! Though it was not on the market, the owner thought about it and decided to sell it to us. We are now the very happy owners of this Hilo gem. Incredible views, very private, indoor and outdoor living spaces, convenient to town and shopping, walk to the beach! Great views of Honolii Beach and the coast line to the north from the kitchen, master bedroom, dining room, living room and the deck. We have unobstructed views of both Honoli'i Cove (primo surf spot for Hilo) and to Hilo Bay... and greater than 90 degree view of open ocean in between. Love looking out at that big blue ball! House is oceanfront, on a promontory cliff. 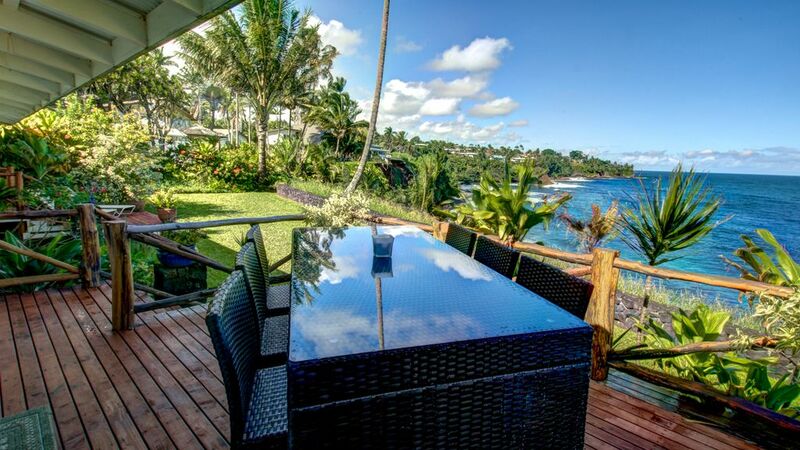 Phenomenal views of surfing at Honoli'i, Hilo Bay, rugged coastline, and open ocean. Panoramic views of the ocean from the house, the dining deck and the covered lanai. The property is on a cliff promontory directly over the ocean. There is no access down to the water from the house but Honolii Beach park is a 3 minute walk or a one minute drive from the house. Two car garage plus paved area in front of garage. High speed internet connection and a strong WiFi signal throughout the house. Dining table seats 6. Breakfast bar seats 4. Bar height wicker table with glass top and 6 chairs. Full ocean view, and view of surfers at Honoli'i. Perfect spot for breakfast or lunch. Great place just outside of Hilo - you couldn't get closer to the water! Amazing to wake up each morning - sunrise out one window and many surfers out the other. Truly a great place to stay....and fall asleep to the ocean waves. We spent four days in this wonderful house. We travel a lot and therefore live in many different accommodations, but this house is one of the few where everything is perfect. It is very well maintained, the furnishings are tasteful and of high quality. The view from the terrace is fantastic, so you can spend hours there. Last but not least we would like to thank Randall for his helpfulness. We can warmly recommend this accommodation. We had the beat time and will come back again! Perfect! I've stayed in this general area for the past couple of years and this house was always already booked, but I finally got lucky and was able to stay here this trip. It is very private and peaceful, and conveniently just a couple of miles from Hilo. The huge picture window in the living room really brings the outside environment into the house. The owners have nicely decorated the place and the kitchen has all the amenities one would need. Beds were very comfortable and it was nice to have ensuite bathrooms in each bedroom. Honoli'i beach is just down the road (maybe 10 minute slow walk) and it was fun to beach comb and watch all the surfers, which you can also see off the back of the house. I wish this was my house, and I'm glad it is a rental so I could experience staying here. I'm looking to book again next year, before it fills up! I have to rate this house in the top two of places I’ve rented. It was clean and had all the amenities one would need. The location to Hilo and proximity to the surfing beach and other sights around the island is excellent. The manager, Randall is an excellent host. We would not hesitate to stay here again. Given that the house is situated on a cliff overlooking the ocean, with only a low rock wall for a visual demarcation, this property is not suitable for all children. Call to discuss. Renter is responsible for all guests' safety. All guests must have the good common sense to not explore the cliff-edge beyond the low rock wall.